If you are looking for a Probiotic supplement for your favorite K9 you might want to try K9 Supreme Probiotics +Plus. It does have a few warnings do not feed to cats, breeding dogs in heat or Pregnant dogs. Other then that it seems like an easy way to get Probiotics into your dogs system. Can be mixed with their dry or wet food. I do suggest if you have cats like ours that like to devour the dog food as well as their own that you take a small amount of wet food, but the probiotic on it, feed to your dog right away to make sure your kitties don't get any. You use half a scoop each day and that is it. Here is to better digestive health for you pooch. You can purchase K9 Supreme Probiotics +Plus on Amazon. What Pet Essential Products has to say about their product. K9 Supreme Probiotics + Plus* for Dogs is the latest product from Pets Essential Products based on canine science. 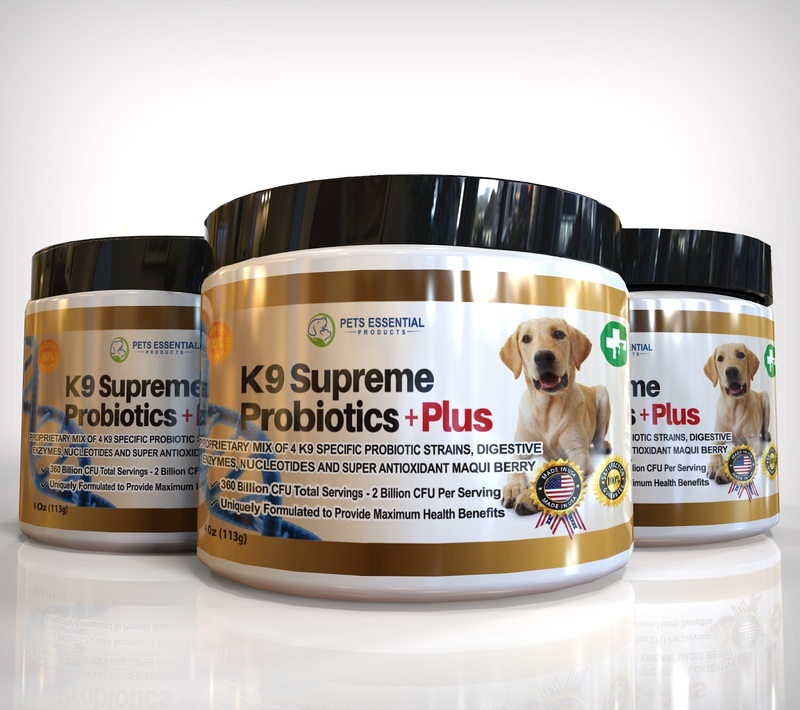 K9 Supreme Probiotics + Plus contains 2 Billion CFU/SVG of four strains of dog specific probiotics - twice as many healthy dog probiotics than found in other generic brands. It also contains digestive enzymes for dogs, nucleotides and antioxidant Maqui berry. All in one Jar! K9 Supreme Probiotics + Plus is 100% Natural, and contains no by-products, harmful chemicals, flavorings like silicone dioxide, and MSG. It is Made in USA in FDA and GMP certified facility and every batch is third-party tested for purity! K9 Supreme Probiotics + Plus is a premium probiotics blend formulated specifically for dogs. The probiotics powder is 100% Pet Invisible (Odorless & Tasteless), it is easy to use, just mix in food, serve and leave. You do not need to chase your dog to eat it. The product is 100% safe for your dog as powder eliminates chocking hazard. K9 Supreme Probiotics + Plus provides a guaranteed relief from diarrhea and other GI upsets like bloating, flatulence. It helps with skin allergies and hot spots, and improves coat by making it shinier. K9 Supreme Probiotics + Plus is the ultimate solution for dog owners that want their dog to have a healthy intestinal tract and strong immune health. Disclosure: MarksvilleandMe received one or more of the products mentioned above as part of a promotion with Tomoson and Pet Essential Products. Regardless, MarksvilleandMe only recommends products or services we use personally and believe will be good for our readers. Some of the links in the article may be “affiliate links.” This means if you click on the link and purchase the item, I will receive compensation. If you would like MarksvilleandMe to review a product or service please contact us at marksvilleandme@gmail.com.